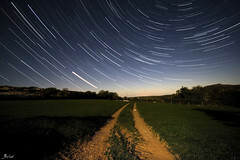 A relatively short (1 hour) star trail I took last night. The moon was pretty full hence it looks so light. The bright star you can see on the bottom left is actually venus and not a star.